It doesn't look like there is too much activity on the forum these days, but I'll post something and we'll see where it goes. I learned about the forum through a David Rapoza Gumroad tutorial. He mentioned the forum in the tutorial and I thought I would check it out. I won't be too long here, but let me briefly explain what i do and my goals. I have been sculpting for years, but I did start out drawing. I just ended up focusing on the sculpting and never really developing my drawing skills to the degree I would have liked to. So now I am giving sculpting a rest and starting to spend more time drawing and getting into digital art. I am a complete newbie with digital painting. I learned some basics and completed my first few digital paintings after taking an Udemy course on painting faces taught by concept artist, Hardy Fowler. I have much to learn, and that is part of the reason why I am here. I am hoping to exchange thoughts and ideas with other like-minded artists, and also I was hoping I would find some motivation to continue with my practice through this forum. I work a full time job and sometimes it's not easy to find the time to draw and paint, let alone the drive, but I am not one for excuses, so I am making sure to fit artwork into my schedule each day. Okay, enough about me. Just wanted to introduce myself and start off by sharing a couple of work-in-progress pics of a painting I am working on now. This is a painting of my niece when she was approximately 12 months old. She is now 22 months. The likeness is not spot on by any means, but it does look like her. I am not too worried in nailing the likeness though. This is more an exercise in painting. So I started out in grayscale, and then I tested out some color, adding the base and red tones with a soft light blending mode in Photoshop. Both versions are incomplete and need a lot of work. I just wanted to see if I might get some feedback. You can be brutally honest. I am eager to learn and improve. I'm really new to this medium and I want to learn all that I can. I admit it's a bit intimidating when I look at the incredible digital art out there; however, it is also very inspirational to me. Thank you all for looking and I hope we can have some conversations around art and shared interests. Welcome to Crimson Daggers Shinkasuru :). There is still some life of a sort left here so come on in and join the party :). 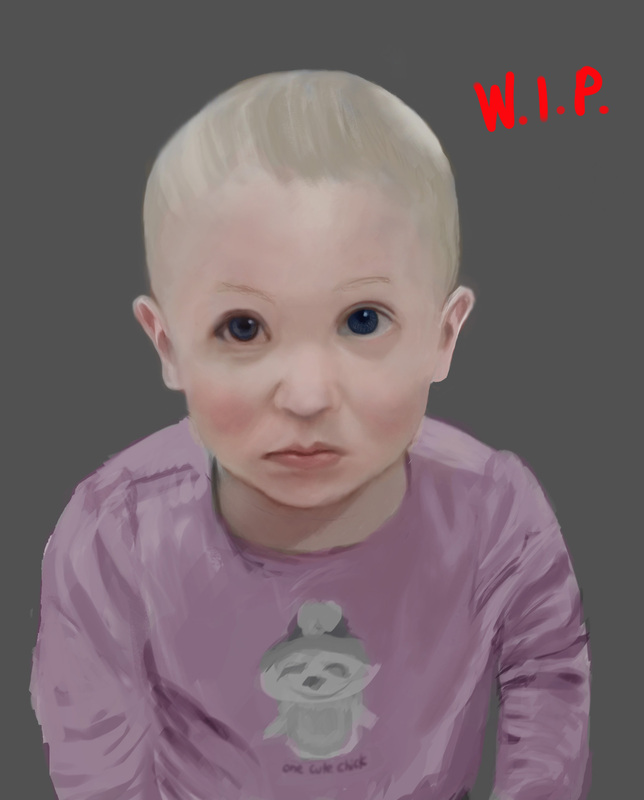 Nice start with that painting, your proportions and colours look pretty good to me so far without seeing the ref. If it was me I would now go in and refine the areas I want to draw attention to and leave the rest less defined but it's up to you. (10-06-2018, 02:14 AM)Thank you, Artloader. I agree with you about refining the areas I want to draw attention to and leaving the rest less defined. That has always been a problem for me and I often spend too much time on detailing. That\s not good for me, because I tend to grow bored and leave a lot of projects unfinished. I would rather focus on quantity at this point and learn from everything I do.I looked at your sketchbook. You have some really nice work and your growth as an artist over the last couple of years is evident. It's people like you who are very inspirational to me. i used to lurk at the forums on conceptart.org, and I remember feeling bolstered by users who have grown into fine artists over the years. You would see them posting their studies throughout the years and continually improving. If I have any goals here it is just that: to be consistent, continue to do studies, post them, get feedback, and improve. Hopefully my motivation and drive will continue. Wrote: Welcome to Crimson Daggers Shinkasuru :).